The Chinese cruise industry took a giant step forward today when Carnival Corp signed a memorandum of agreement to order two Vista-class ships for use by their new Chinese brand. The MOA for the two ships also includes an option for two additional ships. The order is also another first because the ships are the first ordered from the joint venture Chinese yard that is a partnership between China's CSSC - China State Shipbuilding Corp - and Italy's Fincantieri - the world's largest cruise ship building company. Cruise ship passengers visiting Barcelona soon could be paying a tourism tax if local officials have their way. The tax is currently only levied on visitors staying overnight in hotels, and expanding it to all visitors would greatly expand the revenue. Last year there were 30 million visitors to the province of Catalunya (where Barcelona is located) but only 8 million were subject to the current tax by staying in hotels. The show will debut on the ship's inaugural voyage from Singapore in January and then be added aboard other ships in the fleet. The final ship to have the musical will be Seabourn Ovation on its inaugural voyage in the spring of 2018. Details appeared in the September 22 edition of Cruise News Daily. Something happened today in Juneau that hasn't happened in seven years. Alaska welcomed its one millionth cruise ship visitor for the year. The last time this happened was in 2009. You may not have heard much about Tropical Storm Karl since it's not affecting the United States, but it is due to brush by Bermuda Friday night, and the island is now under a tropical storm watch. MSC will more than double their capacity in China in 2018 when MSC Splendida is deployed there. It will also bring the luxury of MSC Yacht Club - MSC's ship-within-a-ship - to Chinese travelers for the first time. MSC Splendida will join MSC Lirica there in May 2018. Details appeared in the September 21 edition of Cruise News Daily. Beginning this week, Fathom has expanded their shore excursions on the island of Cuba. The line has added three new excursions, two from Havana and one from Santiago. PBS favorite, America's Test Kitchen, is going to be taking up residence this fall in the Culinary Arts Center aboard two Holland America ships as part of the line's extensive enrichment program. HAL has been a sponsor of the PBS program, and now they are bringing parts of it aboard their ships. The Culinary Arts Centers will actually be transformed to look like the ATK sets. The shipboard shows will be hosted by Holland America chefs trained by ATK culinary experts. They will include both cooking demonstrations and hand-on workshops. The complete story appeared in the September 20 edition of Cruise News Daily. 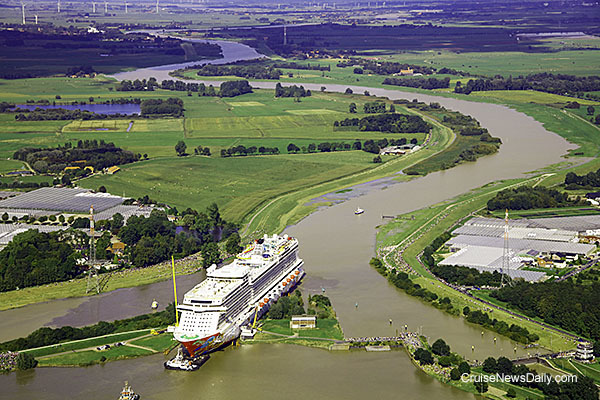 Genting Dream was conveyed down the Ems River from Meyer Werft in Papenburg, Germany, to Eemshaven. We have photos and video below. Carnival Cruise Line has teamed up with Ellen Degeneres to appear on her show and digital platforms this season in a number of ways. Details appeared in the September 20 edition of Cruise News Daily. 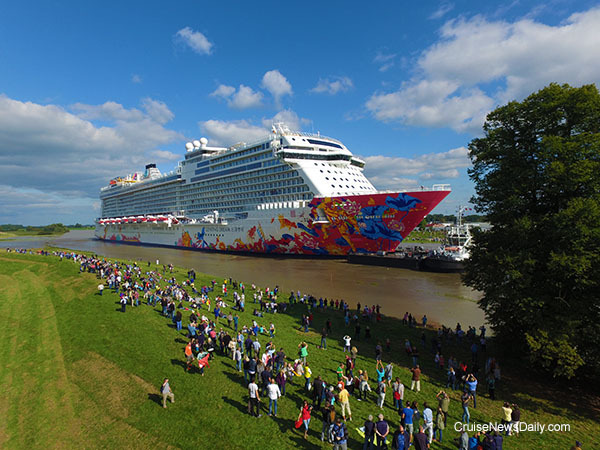 Genting Dream made its voyage down the river backwards for better maneuverability. There were many places along the route where the ship had only inches to spare on either side. Photos and video courtesy of Meyer Werft. All rights reserved. May not be copied o used without express permission. Remember when you were a kid and Saturday morning you could spend the whole morning watching cartoons on TV? Have you turned on network TV lately on Saturday morning? Thanks to the advent of cable channels with channels dedicated to cartoons 24/7, Saturday mornings on network TV are filled with news and educational stuff. But amongst the educational stuff you are soon going to be able to find three half-hour series that will subtly sell you on the idea of going on a cruise thanks to Carnival Corp. The complete story appeared in the September 19 edition of Cruise News Daily. Details appeared in the September 19 edition of Cruise News Daily.